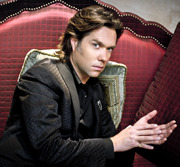 Affectionately referred to by Elton John as "the greatest songwriter on the planet" and praised by the New York Times for his "genuine originality," GRAMMY nominee Rufus Wainwright has established himself as one of the great male vocalists and songwriters of his generation. He is the son of folk singers Loudon Wainwright III and the late Kate McGarrigle, but Rufus has achieved his success by carving out his own singular sound in the worlds of rock, opera, theater, dance and film. Wainwright's catalog includes nine albums and two DVDs to date, and he has appeared on numerous soundtracks and compilations, as well as collaborating with artists like Elton John, David Byrne, Rosanne Cash and Keane. Join us as we welcome Wainwright to the Clive Davis Theater for an intimate interview and performance. Hosted by GRAMMY Museum Executive Director Bob Santelli, hear Wainwright speak about his musical upbringing, his career in entertainment and the making of his latest Mark Ronson produced album Out Of The Game, which was released earlier this year.